A Slice-of-life series that I recently picked up. It’s one of the slow moving series that I’ve picked up so far. Most of the anime I’ve watched in the past. The pace is relaxing and steady. While slow compared to the normal anime I watch, it’s a steady pace, where things unfold accordingly and not too overwhelmingly. This is Season 1 of Aria release in 2005. January 8th is when season 3 of ARIA begins. Plot. Akari is a Gondolier in training on the planet Aqua, previously Mars. The anime follows her daily life as a trainee under the kind Alicia. We follow Akari’s hardships and laughter, as she meets fellow Gondoliers and we learn about life on Aqua and gondoliering. Its set in the 24th century, and Aqua replicates Venice on planet Earth (known as Man-home). Each episode is a bit of a story itself, rather than really having a whole picture. You can probably miss a few episodes and still understand the overall story, though you might have some trouble with new terms specific to this world. Charaters. A mix bag of characters with a few personalities, nothing extrodinary, but the Seiyuu has one well with the voicing. So far I’ve oly seen 2 episodes, so the characters are still being introduced. 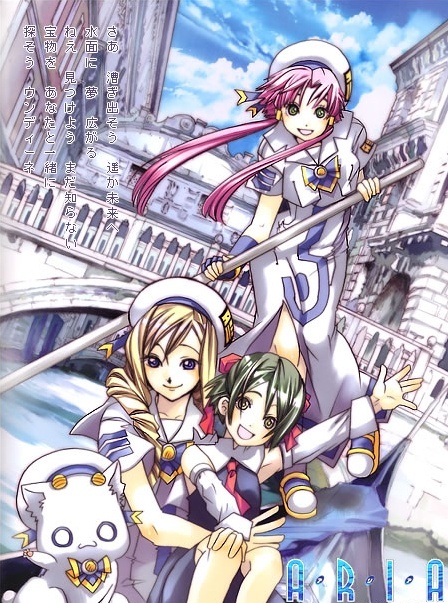 The main character is the kind and gentle Undine in training, Akari, who works for ARIA company, under the supervision of Alicia, one of the famous Water Fairies. We’re introduced to the other Water fairies and undines in the business. As well as the history of Aqua and Neo-Venezia, and how the whole Undine/gondolier system works. More background (and spoilers!) in Wikipedia. Music. Slow, calm and peaceful, the music and BGM certainly suits the pace and plot of the show. Animation. Is pretty darn good. A change from the typical cel-shading of the more action packed anime and so forth. The scenery is stunning and well drawn. It has been animated by the less known Hal Film Maker who I think have done a fantastic job overall. During the less serious moments, the characters often display more chibi-type faces and expression, which adds a few chuckles. Overall. I hvae high hopes for this anime and possibly the sequals (and preequal - Aqua - which follows the life of Akari as a Pair when she first arrived on Aqua a year ago). For first impressions I would give it a 7/10. First episode was slighly slow movign and a tad random since I had no idea what was going on, but as we follow on to the subsequent episodes, you feel more absorbed. watch all 3 seasons. it’s worth it.